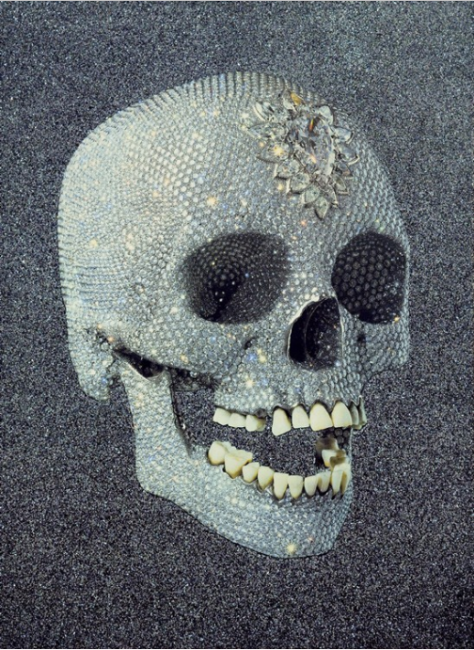 Damien Hirst’s fascination with death and mortality can be seen as a common theme that weaves in and out of his various series. From the more obvious ’Til Death Do Us Part series to the Spot series all of his works are based in the notion of life and death and their precariousness. 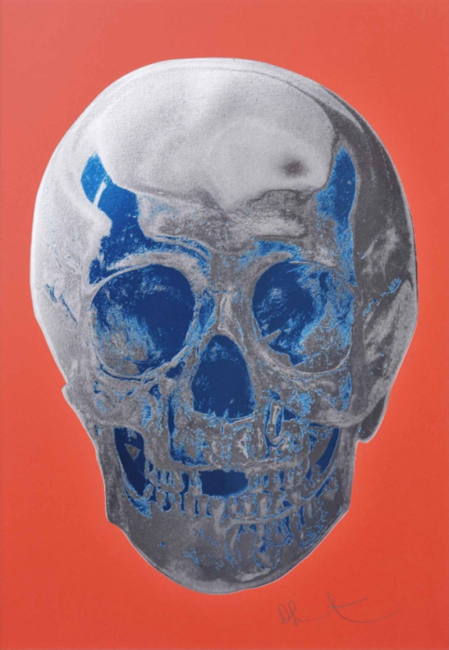 The skull is also used in the ’Til Death Do Us Part series where the metallic skull, placed on bright backgrounds, rebuffs the traditional image of the skull as symbol of death and decay, transforming it into a glorious memento mori. Despite the ambiguity of the concept, this is Hirst’s attempt to present the notion of aspiration to immortality in a playful manner. 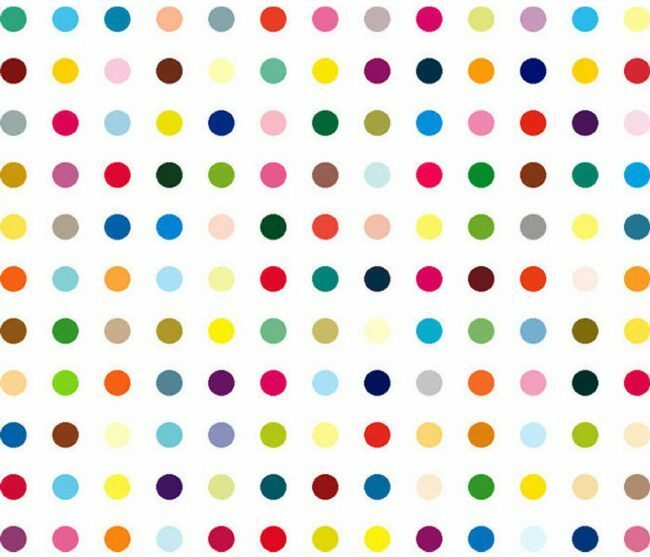 Hirst uses art to change something into something else and thus subvert emotions. His skulls have the capacity to win over death, at least over the temporal, physical and ugly aspect of it – the rotting decay which he explores in his “The Physical Impossibility of Death in the Mind of Someone Living” series from 1991. 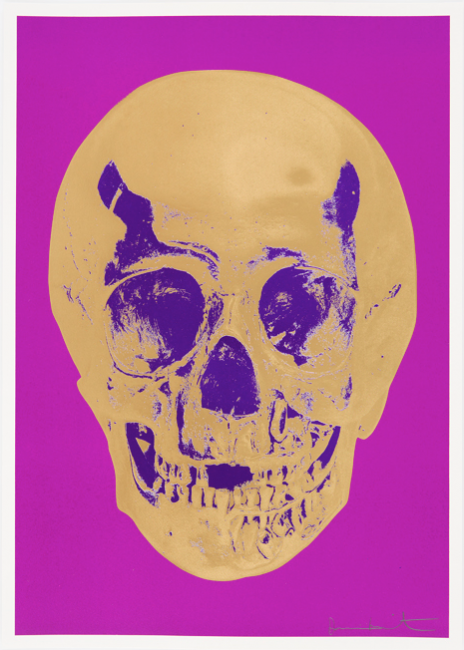 Less literal than the skulls but still tied into the idea of mortality is his The Cure series which features silkscreens of pharmaceutical pills in blazing colors reminiscent of the Pop Art aesthetic made famous by Warhol’s iconographic works on consumer culture. In The Cure, Hirst is commenting on our modern day worship of science and the pharmaceutical industry. 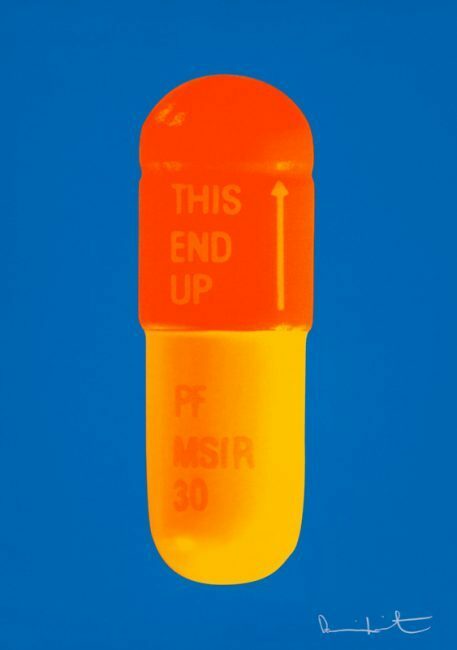 The featured pill is in fact PF MSIR 30 an opiate designed to alleviate pain with a high potential risk for abuse. This modern suppressant becomes a symbol of our sanitized world where pain is neutered and feeling numbed. Painkillers become the contemporary spiritual dependency that allow our bodies to keep living while our soul slip into oblivion. The Spots, like The Cure, revolves around the pharmaceutical industry as they each have scientific titles that connect to the body or to medicine. The works themselves are created using a mathematical algorithm that spaces the spots out so that their diameter equal to the distance between each spot. Made in large part by Hirst’s army of assistants, who rotate between paintings, but allow Hirst to have the final touch, these mechanical paintings are purposefully devoid of any human sensibility.